Today is a sad day for the world of entertainment. “Macho Man” Randy Savage, a former professional wrestler and occasional movie actor, died in a car accident at the age of 58. “Mach” was a major part of my childhood, and I am very saddened to hear of his passing. I grew up watching pro wrestling, mainly on weekends with my father, and Savage was always one of my favorite wrestlers. He was incredibly charismatic and could have a good match with anyone, plus he had one hell of a gorgeous manager (his real life wife at the time, Miss Elizabeth, who passed away in 2003). R.I.P. Macho Man, you will be missed. This news really was day ruining, as I’ve always been a huge Macho Man fan. Definitely one of the best of all time, and one of the few who really was the complete package; talent, look/character, psychology, and promo ability. It was great to see him appear in the WWE All Stars game, and it was his promo for the game that really upped my interest considerably in that game. Been my working my way through the entire roster as Savage in honor of him. Some great videos you posted of some his promos there Eric. I’m going to have to spend the day tomorrow watching my Wrestling Gold DVD’s with some classic 70’s and early 80s Macho Man. I was kind of shocked as to how sad this news made me. I haven’t watched wrestling in many, many years, but this news made me feel like a significant part of my childhood died as well. Savage was the man, no doubt about it. I will never forget his great battles with Hogan, Flair and Steamboat, just to name a few. 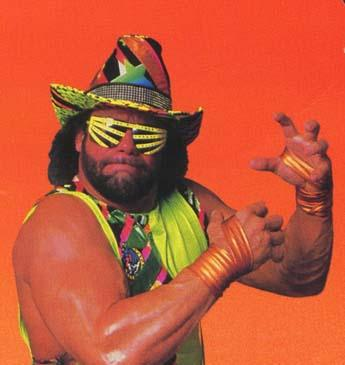 R.I.P Macho Man. Slim Jims will miss you forever.